Invaders #1 review: A bold beginning – AiPT! Invaders is a team with a rich history going back ages. Acting as the vital super-team of World War II, they form the backbone of the Marvel Universe’s superheroic structure and history. They’re the first super-team, the one with Captain America himself. Arriving on Marvel’s 80th anniversary, the book, starring Namor, Captain America and Jim Hammond, the first Human Torch, as well as Bucky, is a massive celebration of all that makes the Marvel Universe special and vibrant. It’s a return of key characters from the inception of Marvel in the late ’30s, even as Timely Comics and a triumphant one at that. Spawning from the talents of writer Chip Zdarsky, artists Carlos Magno and Butch Guice, colorist Alex Guimarães and letterer Travis Lanham, this is a book full of legacy. But it’s not a book that’s merely satisfied with reminding people of its heritage, which so many hold dear. This is a book with great ambition and on Marvel’s 80th, it looks to be changing the Marvel Universe with bold new ideas and additions. It’s this clear, exciting vision that makes it the absolute worthy bearer of its mighty legacy, because only by bringing a fresh lens with reinvention and new ideas can you truly honor the Marvel world. That is the truest way to celebrate this majestic universe that spawned from the minds of so many creators, whether it be Bill Everett, Jack Kirby, Joe Simon, Roy Thomas or Sal Buscema. We’re reintroduced to our entire cast right out the gate as the book moves through history to juxtapose both past and present, showcasing the great contrast of our leads. All the heroes the title promises are very much here and we get to see what they’ve been up to. 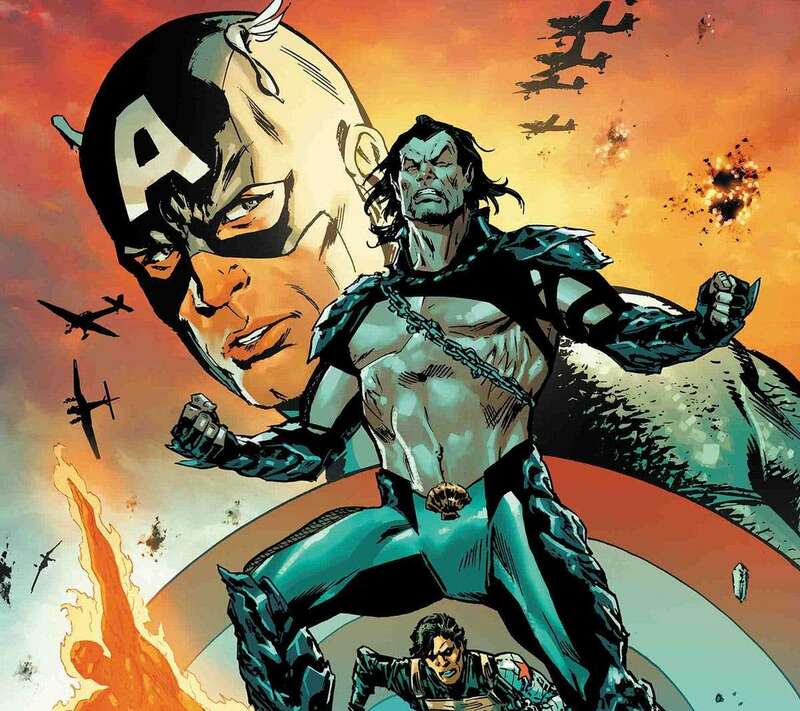 From Jim Hammond, the original Human Torch to Captain America, Bucky Barnes and Namor, their ties and history as The Invaders are clearly established. Captain America’s with the Avengers, Hammond’s working on a book, Bucky’s taken on a new mission and as for Namor? Namor has great plans and he’s recently formed his Defenders of the Deep. Namor very much takes center stage in this saga, as the entire narrative is built around and driven by him. He has a new vision, one to utterly reframe the world and here he begins to set in motion the foundations to accomplish his goals. Meanwhile, the other Invaders contemplate their stance on him and what to do with him, considering their old friendship. Memories and War are key themes the book establishes early on, which is fitting considering its nature as a title with great history and legacy. It directly tackles those notions at the heart of the Invaders title and concept while digging into the leads. Zdarsky, who’s written a defining run on Peter Parker, is once again showcasing his incredible range with the title. Many often simply assume he is only a comedic writer, but Zdarsky is a creator bound by no such labels and Invaders is a mighty mission statement that rings with the potency of a Mark Gruenwald comic. Carrying similar weight and gravitas, the book sets up and begins to explore ideas of memory and how it truly makes us who we are and what place forgetting has in things. Beyond that, it also reminds us to truly take stock of our history, both good and bad so that we may learn from it and move forward. This plays out across our various leads in differing ways, as what one learns can drastically differ from person to person. Artists Carlos Magno and Butch Guice bring a brilliant range to accompany Zdarsky’s own here, swiftly moving through old warzones to underwater cities and even Avengers Mountain. And for every element they go through, they manage to perfectly capture and frame the content in ways that enhances every sequence. Whether it be the opening where in rubble is unrestrained by even the panel borders, which sells the true intensity and danger of the sequence to the absolutely exhilarating double-page spread in the issue, it all weaves together perfectly to make for a marvelously thrilling comic. Magno and Guice also really set the perfect tone and imbue every moment with an incredible level of characterization, which really comes through in the silent panels. There are moments where Guice’s work is reminiscent of Lee Weeks, while Magno’s is of Doug Mahnke, as body language and sheer expressiveness in the art tell the reader all they need know about a character or a scene. Colorist Alex Guimarães really unites the work of the team and contextualizes the world and characters on Invaders beautifully, carefully pulling off a balancing act between fairly muted gritty war drama and eye-poppingly bright high fantasy epic. He’s very much the bridge and the glue that makes the book work and it is an commendable effort. The book looks absolutely stunning, filled with a great sense of atmosphere and mood. Letterer Travis Lanham runs with Zdarsky’s script and carefully navigating through the art by Guice and Magno, accentuates and ensures the impact of every page. Even simple things such as gunfire are presented through varied fonts in distinct color to appropriately convey the meaning of each shot and what that implies. Lanham really makes the work sing with clever and effective choices throughout and rounds out a top-notch team brilliantly. Invaders #1 is a bold new look at the classic team and it is far from a convention team book. Packed with tons of conflict, heavy emotions and a clever and nuanced handling of history and character, this is as big a superhero comic as you could hope for, whilst being utterly intimate. And to deliver on that, the book holds a massive, world-changing secret that could raises many questions and teases big things for the entire Marvel Universe itself. Zdarsky, Guice, Magno, Guimarães and Lanham have truly crafted what can only be described as definitive but fresh renditions of the iconic characters we love. Don’t miss this one.